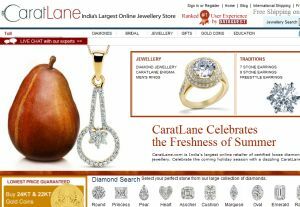 Chennai-based Caratlane Trading Pvt Ltd, which runs the online diamond and jewellery portal CaratLane.com, has raised $6 million from Tiger Global Management LLC. The company will use this round of funding to consolidate its position in the online diamond jewellery space and to develop a larger national and international footprint for itself. This is Tiger Global's seventh deal in the Indian e-commerce sector in the last 12 months. Since June, 2010, the investment firm has participated in two rounds of funding for Flipkart.com (which raised a combined $30 million), and invested in online fashion flash sales site Exclusively.in, babycare products retailer Babyoye.com, clothing and footwear merchandise retailer Myntra.com and electronics retailer Letsbuy.com. CaratLane was founded in 2008 by Srinivasa Gopalan (an IT entrepreneur who was the founder and CEO of Lister Technologies) and Mithun Sacheti (scion of Jaipur Gems, which has stores in Mumbai, Chennai and Coimbatore). On an average, it has been selling 15 solitaires a day and its pricing is up to 25 per cent lower than the retail chains across the country, according to the company. It claims the average ticket size of transactions on CaratLane is Rs 80,000. CaratLane's revenues are growing 300 percent year on year, and the company is now targeting an annualised run rate of $30 million by March 2012. "The e-commerce industry is set to boom in India, and we were among the few to have foreseen the market and started CaratLane in 2008. This inflow of funds will be used to strengthen our backend operations and augment our customer base through enhanced reach, owing to a refreshed approach to our marketing and brand-building effort," said Mithun Sacheti, CEO of CaratLane. India's e-commerce market is expected to surge 47 per cent to Rs. 46,000 crore (around $10 billion) this year, according to estimates by the Internet and Mobile Association of India.